BIG (Brazil’s Independent Games) Festival, the largest independent video game festival in Latin America, today announced that independent game developers from around the world can submit their games to be selected for the 2018 BIG Award. 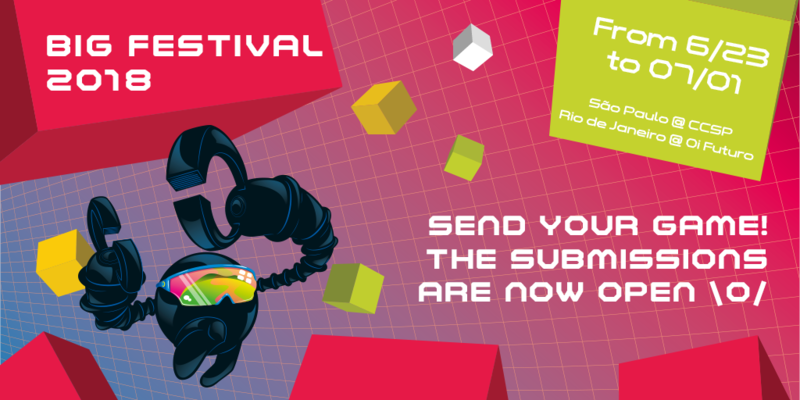 The registrations are officially open until April 13th and must be made through the official site: www.bigfestival.com.br . BIG Festival is an initiative created by the Brazilian Game Developers Association (Abragames) and the export program Brazilian Game Developers, in partnership with Apex-Brasil (the Brazilian Trade and Investment Promotion Agency). The sixth edition of BIG Festival will take place from June 23rd to July 1st at the Centro Cultural São Paulo in the city of São Paulo and at Oi Futuro in Rio de Janeiro. The finalist games, developed for computers, tablets, smartphones, consoles and VR devices, will be available at dozens of stations for the public to enjoy during the free event and play them in order to contribute to the awards by voting for their favorites. All registered games will be analyzed by the Festival Selection Committee and the selected ones will compete in categories such as Best Game, Best Sound, Best Art, Best Narrative, Virtual Reality. The winners will be announced on stage at the event. Finalists will also receive free access to the business round tables of the largest Latin American games and animation industry hub, and may have the opportunity to give a talk about their game. In the last edition, 3200 industry professionals were in attendance with the objective to strengthen and create opportunities for the industry. In 2017, Overcooked, from British developer Ghost Town Games, was awarded with the Best Game award, in addition to taking the category for best Gameplay. At the same time, Distortions, from São Paulo based studio Among Giants, was chosen as Best Brazilian Game and pleased most of the 20 thousand people who visited the event, also winning the votes for the Most Popular award. This year, BIG Festival is introducing a novelty by taking some of its activities to Rio de Janeiro. BIG Rio will take place from June 23 to July 1 at the Oi Futuro cultural center in the capital of Rio de Janeiro. The main theme will focus on the social impact created by video games and a free display of curated titles playable throughout the event will be available, in addition to panels and discussions on June 29 and 30, in partnership with Oi Futuro, the innovation and creativity institute of Oi, one of the biggest internet and phone companies in Brazil. The BIG Festival is the main showcase for independent games in Latin America and has already awarded prestigious titles from around the globe in the five previous editions including SUPERHOT, This War of Mine, Gorogoa and Nom Nom Galaxy, as well as the Brazilian Horizon Chase World Tour, Toren and Aritana and the Pen of Arpia.